Sabrblade wrote: The back end of the car goes pretty far inside the trailer; about halfway through it, even. It's just that the car's front has a really long nose. Maybe I'm old and can't remember, but back in the day the Space Winnebago looked mostly like it does now. chuckdawg1999 wrote: Maybe I'm old and can't remember, but back in the day the Space Winnebago looked mostly like it does now. 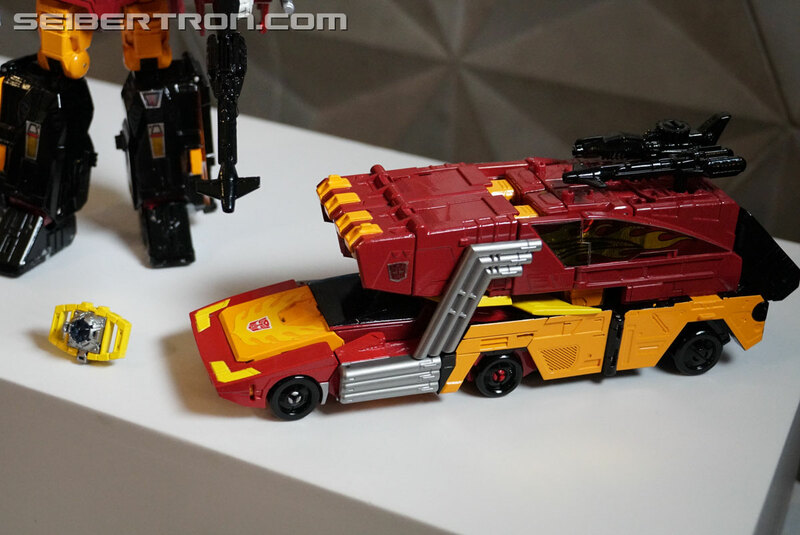 It's because of the figure maintaining the proper shape of the car, whereas in 1986, Rodimus Prime's cab was like a more squished and scrunched-in version of Hot Rod's car mode. As though Hot Rod had crashed his car mode hood first into a wall, and then had someone stick a trailer on his back. He's a space limobego now. william-james88 wrote: I disagree. There is a transformation aspect to the Cybertronian winnebago mode where the tubes connect to give the impression of a continuous vehicle. I much preffer this to the major cheat that was MP 09. So yeah, with no exageration, POTP Rodimus' alt mode is above MP quality engineering. william-james88 wrote: There is a transformation aspect to the Cybertronian winnebago mode where the tubes connect to give the impression of a continuous vehicle. I'm not seeing that at all in the POTP figure, well not in the images above anyhoos, the pipes don't even look aligned let alone connected. I got the POTP Roadtrap and Battleslash today, I'd forgotten how much I dislike the faction symbols not being purple, but a nice combo of figures and finally some more decepticons for my shelves rather than repainted autobots. At least combined the modes decepticon symbol is purple as I'll never get around to getting stickers for them (still have the Hasbro TR & Combiner wars stickers that dont stick to put on some of the figures). Or even just a motor home altmode, period. English Reviews has appeared on youtube for wave 3 monsterbots as well as abominus. Personally I'd want to see a bus, either a yellow schoolbus or a public transport modern bus design. We have some cool news for all your Transformers Power of the Primes fans. Fellow Seibertronian Bacem has informed us that Chefatron has now released video reviews for the deluxe Monsterbots that come out in wave 3 of Power of the Primes. They are Sinnertwin, Cutthroat and Blot. He then also reviews the combined Abominus. This means that the toys are out in the Philippines, but from previous experience there is usually about two months in between toys showing up there and being found in the US. Just letting you know in case some of you are going to run to a local store looking for them tomorrow. Wave 3 is scheduled to be on the shelves in the summer (around June). But until then, you can check out these reviews to see if completing Abominus is worthwhile. Also, just to reiterate for those who might be waiting for a box set, Takara will be releasing the exact same toys in the same way. I need that abominus in my life. I never get when people say they are thankful when characters have their original names or get upset when a characters name has to change due to legal reasons or the name being inappropriate for modern day standards. It’s your toy once you buy him you can call him anything you want. Who’s stopping you?